In our startup video game museum, everything is done by volunteers on a ridiculously limited budget. So it’s always a balance between collections care and – well, everything else. My biggest anxiety last year was light damage. We removed half the fluorescent bulbs in the collections area and covered the remaining ones with UV shields; not too expensive, and it was work that was easy to get done. But the big expanse of glass in the room where we install our exhibits remained unprotected. No one was willing to tackle the exacting job of applying UV film, and having it done was far too costly, especially in a facility we were renting short term. We put in a display of items of interest but easily replaceable, and I worried about light. Then one day, our past stepped in to help. 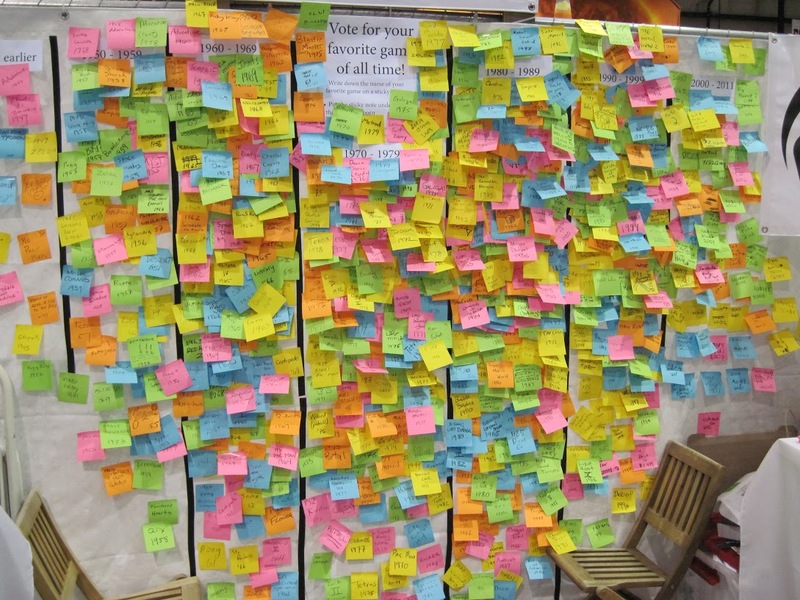 The first public event we did involved a 10’x10′ space that would be difficult to tempt visitors into, so we stopped every passerby we could and had them write the name of their favorite video game on a colored Post-it note, plus the year they were born in. This was, of course, completely for fun and not real research, but there were some interesting things we found nonetheless. 1 We put the notes on the back wall grouped by decade, and it proved to be eye catching display. And we added hundreds of people to our new mailing list, so it was a very effective strategy. 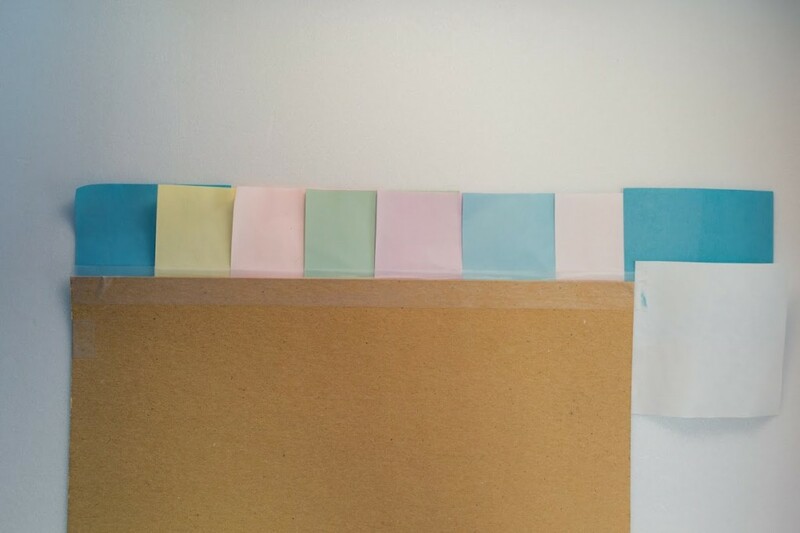 There were piles of leftover Post-it notes; we bought a lot of them to get a good selection of colors. 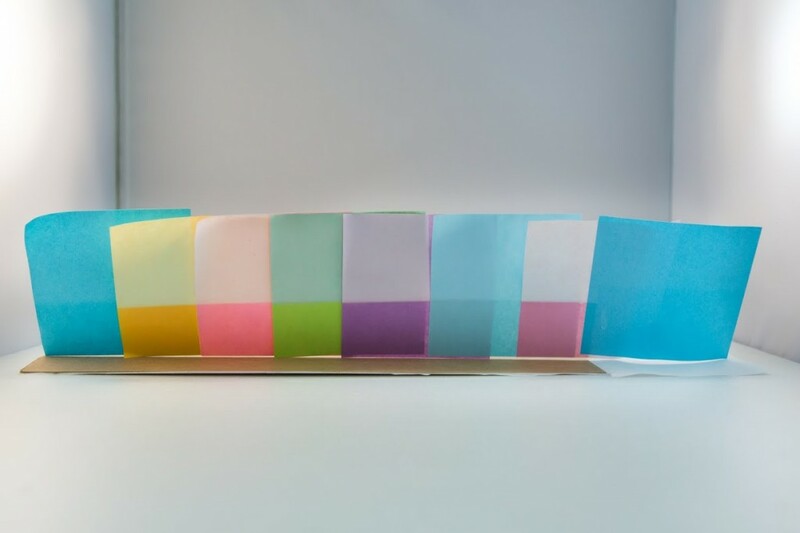 And one day, while worrying about light, I took a sheet of cardboard from the back of a pad of notebook paper and lined up the different colored Post-its so that they would be half behind the cardboard and half exposed. I also overlapped them for no particular reason. And then I hung it in the window. Months went by. I don’t know how many, because I forgot to date it. I’d guess six or eight. We finally bought shielding, even though no one wanted to install it, and I took down the Post-it note color fade tester and asked our photographer to take some pictures of it. The photos that follow show the before and afters. The photo above is what it looked like from the outside of the window when I took it down. The photo below is what it looked like when we flipped back the notes to compare the part protected by the cardboard with the part in the sun. The contrast between the original colors and the part exposed to sunlight is striking, and this is the back of the notes; the fading went right through to the back. The different colors that overlapped even reacted together, so that the orange lying on the blue not only faded to yellow, it also picked up a greenish tinge from the blue. Some of the pink and fuchsia are faded almost to white; those were two different colors when we started: a plain pink and a bright fuchsia. I showed it to the volunteers, and the window shielding went up quickly! 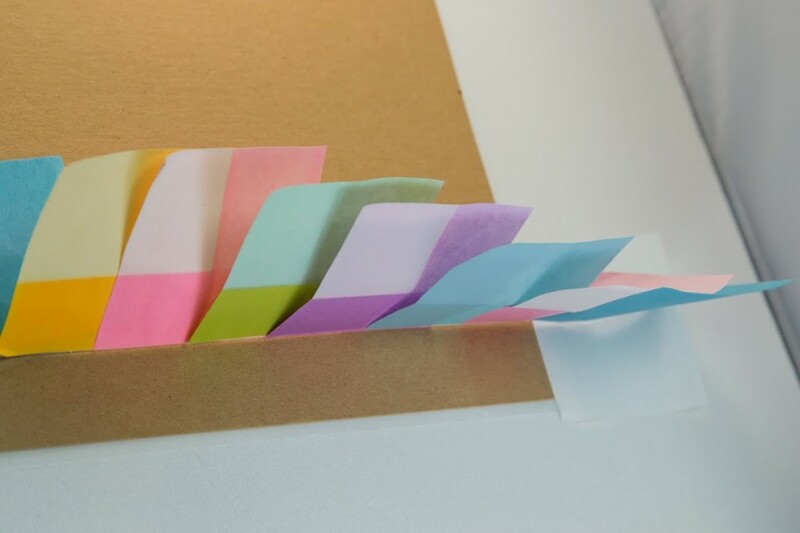 We keep the Post-it fade tester in the museum and show it to visitors when explaining the importance of conservation and collections care. Sometimes, the simplest materials can solve your biggest problems. My partner, Carol Borow, sent me on your article. With our experience, this comes as no surprise to me. However, I wonder if you’d be interested in one additional experiment. Here goes. My understanding is that solar fading damage is caused (approximately) by Ultraviolet radiation (40%); Visible Light (30%); and Infrared radiation (30%); and that installing Ultraviolet-blocking film will give you protection against only 40% of the sun’s damaging rays. At the same time, there are spectrally-selective (virtually clear) window films, e.g., VKool VK-70, which block not only all of the sun’s UV rays, but all of the sun’s IR radiation as well; thereby providing protection against 70% of the sun’s damaging rays. If you wish to experiment with both a UV film and a spectrally-selective UV/IR film, let me know. Should provide a vivid demonstration of how solar fading happens, and what you can do to mitigate the damage that results.